Yep, it’s governnent policies which have mostly destroyed the property supply. Exorbitant taxes on just about everything. Lax credit controls which caused the bust in the first place. Selling off council housing stock. Massive deficit of investment in public transport. Agree with all these points, they claim credit is tighter and for sure it is, but not enough. I was shocked at how much the banks were prepared to lend me recently for a motgage. If I borrowed what they were offeing Id be setting myself up for some serious financial trouble. So they were offering you 3.5x combined salary and you were shocked ? I guess applying for a mortgage is not something I do everyday - who does? In any case, I think if I borrowed what they offered it wouldnt be long before me and my family would end up in financial trouble - deal with that assertion as you will. So we’re comparing the average rent in SCD which is the most expensive part of Dublin with the average of all London rents? It’s obviously apples and pears but why would our paper of record do it? Do we Irish have a curious need to be the most expensive kids on the block? It feels like 2006 again. Sir, – We should not be remotely surprised at the recent Daft report (News, May 9th) advising on average Dublin rents of almost €1,800 per month. Investors have departed in their droves due to over-regulation and overtaxation, resulting in poor returns and a very bad deal for renters, with high rents and poor choice. Renters have the “perfect storm” of difficulties with overzealous central bank regulations stifling serious lending in tandem with every commercial bank looking over their shoulders. He’s consistent, I’ll give him that! all they can work on is a snapshot at a point in time. 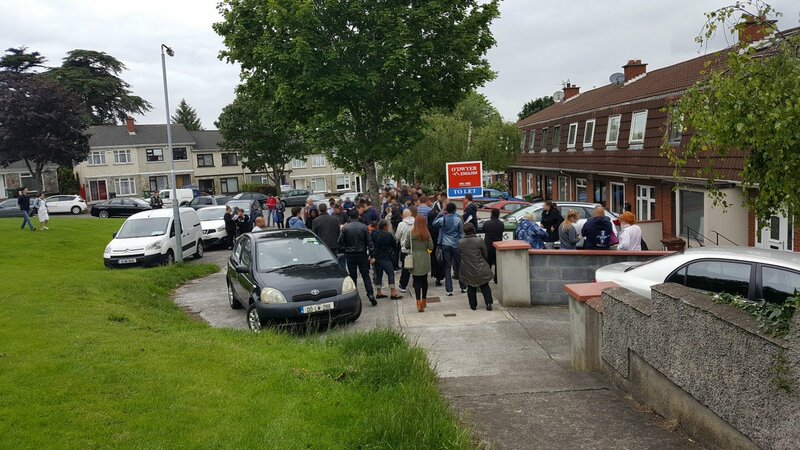 Queue to rent a €1400pm 3 bed little house in Dublin, courtesy Joe Duffy’s Liveline. It’s great that Mansard roofs have such a keen local following. I’m a bit of a fan myself. My apartment is for rent now, I am leaving the country soon. Agent asked us if we don’t mind if they show it to a couple. However, She forgot to finish the email with “a couple… of couples.”. 20 or more people came at the same time with her. This is a fucken joke. She did not even talk to them, now she want another museum tour next week. I can’t wait to enter the plane and leave this craziness behind me. Friend went to his EA to look at changing his apartment. EA told him, for the first time ever he has nothing available on his books to rent. When I want to move back it’s either no jobs or nowhere to live. Almighty pain in the arse. A friend of mine works in Dublin in the moderately glamorous world of selling advertising space. He says he is already losing staff to London. Housing costs are higher there of course, but so are wages, and the 20-somethings reckon it’s an easier place to save. What’s the bets that Ireland fares even worse than the UK on safety of rentals? Almost a third (29 per cent) of homes rented from private landlords fail to meet the national Decent Homes Standard – meaning they either contain safety hazards or do not have acceptable kitchen and bathroom facilities or adequate heating – according to exclusive analysis by The Independent. Here’s the independent.co.uk link but the site seems to be having problems, so here’s the Google cache. I wonder could there be any possible connection to the fact the Tories voted against an amended housing bill last year that would force landlords to address safety issues. I’ve watched and waited, and I’ve finally concluded that I can’t drag my family back to this mess, even through there are opportunities in my line of work. By the time the government get this disaster sorted (or if they do), we’ll be settled some place else. This was depressing viewing, as well as checking daft.ie this morning. how on earth is Dublin supposed to attract Brexit business from London? It isn’t just foreign workers who are leaving on account of this. I am tech and I emigrated last November because Dublin had got to be such a clustermess. I don’t plan to come back this time. I’ve mentioned this in relation to the tech sector quite a few times over the years - this matter was raised by senior staff in multinationals to government on numerous occassions from 2011 on. Perhaps it was because these staff were Irish that mininsters felt they could ignore them, perhaps it was also because these were given as friendly advice. It seems that the multinationals will need to threaten to pull out before this will get fixed (compare and contrast the attitude to changing planning regulation when it comes to Apple’s Athenry plant). Perhaps if Apple were based in Dublin it would be different (not that Cork is immune to accomodation problems but Dublin’s are an order of magnitude greater). One company asked it’s staff to let new employees couch surf while they found their feet in Dublin. They had to stop it because the time it took new employees to find decent accomodation in Dublin was just putting too much pressure on the staff members providing the couch. Left to fend for themselves staff members settled for crap accomodation more quickly. Another company appointed a staff member to find accomodation for new arrivals. The US company said that the person should only acept accomodation that ‘they would happily live in themselves’. This person could not find any accomodation that met the criteria - the person told me that they had never realised how appalling accomodation was in Dublin, and that the price of it did not seem to be any reflection of the quality. Another company now warns potential employees at the first interview that they should research the Dublin housing market before continuing with their application. In addition they should be prepared to arrive at least 4 weeks before starting employment so that they can find somewhere to live. I could go on… The issue affects workers migrating to Dublin from Ireland as well as other countries - many IT students now do their postgrad degrees in regional Universities (because of cheaper accommodation costs) and have to move back to Dublin to get work. There seems to be a view in government that this isn’t a big issue and that it will sort itself out - it won’t - I don’t see any solution that can work without legislative change and in this country that means years. The crazy thing is that office space is probably going to be cheap for the next few years (despite what the Commercial Property VIs say I have not seen companies looking for extra office space having any difficulty expanding) but expansion is going to be limited by the difficulty in recruiting staff because they can’t find anywhere to live. To be honest I think we have passed the point where a solution can arrive before the problem affects the economy - which is utterly depressing. The governments latest ‘Republic of Opportunity’ ads are a waste of money in this climate - the brand is already tainted.